Supercooling, a state where liquids do not solidify even below their normal freezing point, still puzzles scientists today. A good example of this phenomenon is found everyday in meteorology: clouds in high altitude are an accumulation of supercooled droplets of water below their freezing point. Scientists from the Commissariat à l'Energie Atomique et aux Energies Alternatives (CEA), the Centre National de Recherche Scientifique (CNRS) and the ESRF have found an experimental explanation of the phenomenon of supercooling. Their research is published today in Nature. Supercooled liquids are trapped in a metastable state even well below their freezing point, which can only be achieved in liquids that do not contain seeds that may trigger crystallization. Clouds at high altitude are a good example for this: they contain tiny droplets of water that, in the absence of seed crystals do not form ice despite the low temperatures. In everyday life, though, there is usually some crystalline impurity in contact with the liquid that will trigger the crystallization process, and therefore the freezing. Controlling solidification behaviour is important for applications ranging from hail prevention up to technological processes such as welding and casting or even the growth of semiconductor nanostructures. Supercooling was discovered already in 1724 by Fahrenheit, but even today the phenomenon remains a subject for intense discussions. Over the last 60 years the very existence of deep supercooling has led to speculations that the internal structure of liquids could be incompatible with crystallization. Models propose that a significant fraction of the atoms in liquids arrange in five-fold coordinated clusters. To form a crystal however, one needs a structure that can be repeated periodically, filling the entire space. This is not possible with five-fold coordinated clusters. In the two-dimensional analogue, a plane cannot be filled by pentagons only, whereas triangles, rectangles or hexagons can fill a plane perfectly. In this example, pentagons are an obstacle to crystallization. Until today there was no experimental proof that this five-fold coordinated structures are at the origin of supercooling. The researchers from the CEA, CNRS and ESRF studied the structure of a particular liquid, a gold-silicon alloy, in contact with a specially decorated silicon (111) surface, where the outermost layer of the solid featured pentagonal atomic arrangements. Their findings confirmed that a strong supercooling effect took place. "We studied what happened to the liquid in contact with a five-fold coordinated surface", explains Tobias Schülli, first author of the paper. The team performed the control experiment with the same liquid exposed to three-fold and four-fold coordinated surfaces, which reduced the supercooling effect dramatically. "This constitutes the first experimental proof that pentagonal order is at the origin of supercooling", explains Tobias Schülli. It was during their studies, originally focusing on the growth of semiconducting nanowires, that the scientists discovered the unusual properties of these liquids. As they were observing the first stage of growth of nanowires, they could see that the metal-semiconductor alloy they used remained liquid at a much lower temperature than its crystallization point and so they decided to investigate this phenomenon. These liquid alloys are popular in applied research as they enable the growth of sophisticated semiconductor nanostructures at low growth temperatures. Most of these nanowire structures are grown on silicon (111), the same surface used by the team. Semiconducting nanowires are promising candidates for future electronic devices. Prominent examples are solar cells, where scientists are working on the integration of silicon nanowires in order to increase their performance. Isn't it because the pressure up where clouds are is less? pushing the freezing point lower? Space is pretty big so it must be really heavy and it's just sitting on the clouds... I'm no scientist but thats got to be a lot of pressure. Plus the psychological pressure involved... what if the clouds drop space on all those people! If I were water, I'd turn into crystal... yet it stays a liquid, amazing. Pressure doesn't have that much affect on freezing point - some, which is why ice skates work, but not nearly as much as it has on the condensation point. Honestly, the meteorologists & physicists that work on this stuff figure that kind of thing in, as well as things like the difference in the speed of sound, the ability of cosmic rays to act as centers of nucleation, etc. etc. Just a reminder to anyone reading Alizee's comment and thinking that she might have something poignant to add: it is the same person as broglia and seneca, a person that believes that Aether theory (or the theory of everything to nutcases) is the answer and there is a conspiracy to keep it from the public. The article in fact did address her questions, she just isn't able to understand it. Are they sure the video is water, and not sodium acetate? 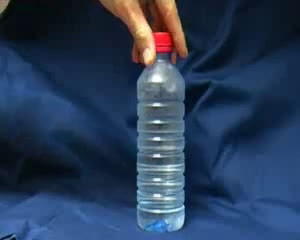 The "water" in their bottle doesn't appear to expand at all when it solidifies. This video looks a lot more like the sodium acetate "hot ice" experiment to me. shouldn't ice expand when it freezes?, why doesn't the bottle burst? 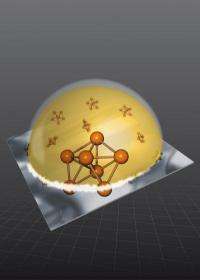 What is the density of supercooled water? If it is the same as one of the forms of ice, there would be no expansion on freezing. The density of water is greatest at 3.98 °C, above the freezing point. What effect does surface tension have on freezing point? If this had an effect different shapes or sizes of crystals would freeze out at different temperatures. The surface tension excerts force to interior of small droplets, thus increasing their melting/freezing point in the same way, like any external pressure. For example, there you can see the video of thin crystal of kitchen salt, which becomes elastic at microscale - i.e. it never freeze completelly. On the same mechanism the stability of tiny atom nuclei and micro-black holes could be based. I'm not a clued up scientist so from a layman's point of view I think clouds hold a lot more incredible science in them then what we think. I've always pondered the amazing fact that up there in the sky [ when in an airplane], we're flying through millions of liters of water that simply defy gravity at will - no outside help [jet engines and the like] required. If we can find a similar mechanism to lift mega liters of other liquids and transport them as effortlessly.....well, whoever does discover how it really works will be rich overnight.